This is our full guide to everything there is to see and do in the Coral Highlands region of Monster Hunter World. The Coral Highlands region of Monster Hunter World is instantly one of the more eye catching locations in the massive game, featuring colorful fourna and wildlife, along with equally colorful monsters. 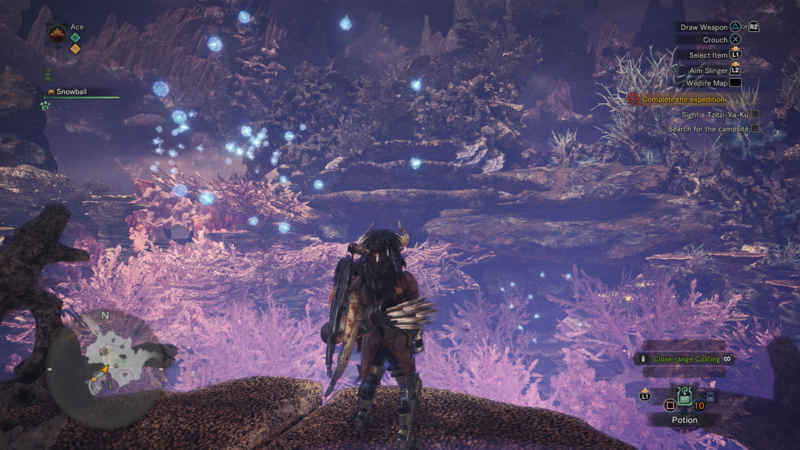 In this Monster Hunter World Coral Highlands guide, we’ll be walking you through all the plants, wildlife and Coral Highlands monsters in MHW that call the region home, such as the Tzitzi-Ya-Ku, the Paolumu, and the Legiana. But if you instead need anything else on the massive game of Monster Hunter World, including how to track down a monster with the Scout Flies, as well as how to safely capture a monster in order to harvest rare monster parts, make sure to check out our Monster Hunter World guides walkthrough hub. You’ll begin your journey in the Coral Highlands in MHW in area 1 of the region, in the Southwest Camp. Drop off the ledge at the end of the camp, and you’ll find yourself in an area with Snow Herbs, Watermoss, Herbs, Stones, and Latchberries, along with a few monster footprints of whichever beast is currently patrolling the surrounding area. At this point, you’re effectively on the ground level of the Coral Highlands region, and the map is actually fairly vertical, challenging players to swing off vines to reach higher areas. If you head east from area 1, you’ll reach the narrow area 2, where you can frequently find Bonepiles, Brightmoss, Herbs, Honey, and Latchberries. If you climb up one of the vines on the east of area 2, you’ll reach the upper area 7, where you can find rare items like a Pearl Oyster. Areas 3 and 4 cover the rest of the ground floor of the Coral Highlands, and in these areas you can find Bonepiles, Wiggly Litchis, Conch Shells, Fire Herbs, Herbs, Brightmoss, and Blue Mushrooms. If a Tzitzi-Ya-Ku is present in the Coral Highlands, you’re more likely to encounter the monster in areas 3 or 4 of the map, than you are anywhere else on higher ground. 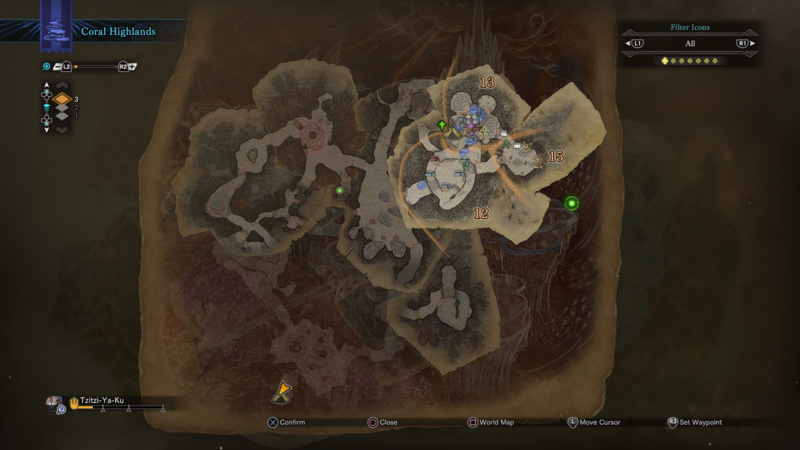 From area 3 of the Coral Highlands in MHW, you can fairly easily reach areas 9 and 10, both of which are located on the middle floor of the map. It’s in area 5 on this level however, that you’ll nearly always encounter the deadly Paolumu. Area 5 is not only home to the Paolumu, but also to a horde of Raphinos, as well as Conch Shells, Sleep Herbs, Bonepiles, Honey, and Latchberries. Moving east from area 5 into area 8 of the Coral Highlands, you’re more likely to encounter the Legiana here. 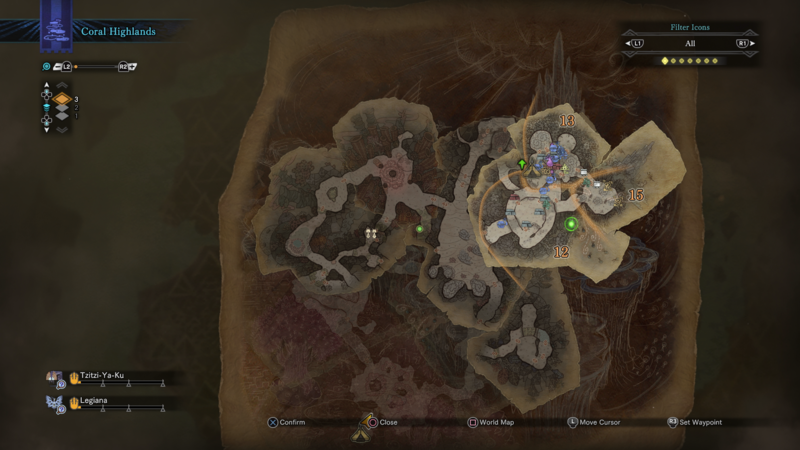 While there are Smokenuts, Sporepuffs, Stones, Nulberries, and Needleberries all located here, you’ll have a great chance of finding the Legiana if you scale the massive vine wall to the east of area 8, climbing up the vine wall to reach area 12. You’re now in the very upper reaches of the Coral Highlands map itself, and you’re also well and truly into the hunting grounds of the Legiana. Areas 12, 13, and 15 are the highest areas of the Coral Highlands, but it’s in the latter area where you can find two rare Mining Outcrops, both of which have an increased chance of rewarding you with items like Dragonite Ore and Earthlight Crystals. Areas 15 is also where the Legiana will retreat to once you’ve dealt enough damage to it, but otherwise the monster will patrol the skies around areas 12 and 13. You can also uncover the second Camp in the Coral Highlands in area 13, but while it’s actually located in the higher region, you’ll have to uncover it by crawling through a tiny hole in a rock wall in the east of area 10, which itself is reached by heading north from area 8. 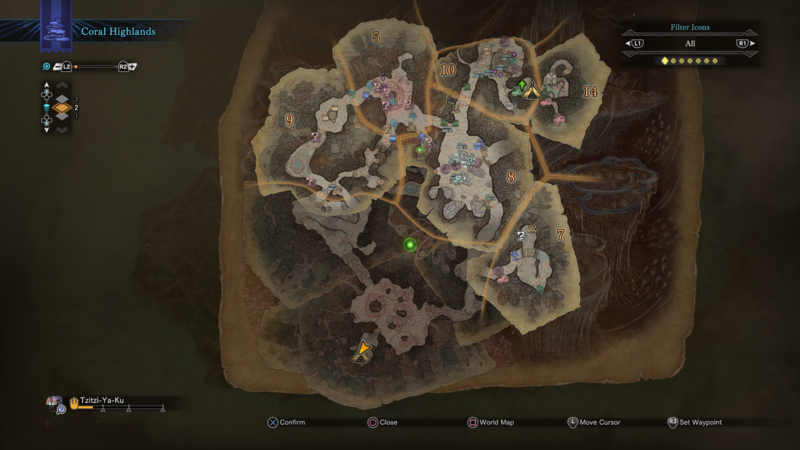 This might be the end of our Coral Highlands guide for MHW, but why not continue to our additional guides on the game, including how to track and kill the Legiana, as well as how to master the Insect Glaive weapon.